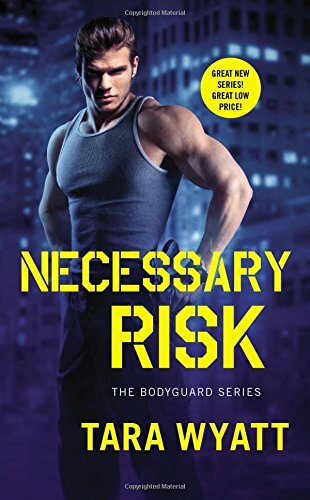 Sierra Blake, the heroine of Necessary Risk, is a former child star who has stepped away from acting after some wild years. Now she’s the spokeswoman for Choices, a reproductive rights organization, and someone takes serious exception to that. An unpleasant incident at a fan convention is only the first salvo of a campaign designed to make her step away from her cause. One should note here that this book doesn’t focus on political issues. Choices, the organization Sierra represents, is part of the plot in that it’s up for a major grant other organizations want, but readers need not fear becoming mired in controversy. A family tragedy led the book’s hero, Sean Owens, to give up a budding career in pro baseball to work for his father’s security firm, Virtus. He encounters Sierra just after the convention confrontation. Another incident occurs that night, and she hires him to protect her. Sean and his father have had a difficult relationship for several years, and the friction between them complicates Sean’s efforts to protect Sierra. So do the ongoing interest of her former boyfriend, a state senator, and her commitments to personal appearances on behalf of Choices. The attraction between Sierra and Sean is immediate and intense. Because he’s her bodyguard, however, he’s reluctant to become involved lest doing so distract him. Both of them fight this pull, but its intensity overwhelms their intentions. As the attacks against Sienna escalate, so does the passion between her and Sean, building to an explosive finish. Wyatt establishes a circle of friends for Sienna and a group of comrades for Sean who are interesting and loyal and thus have the potential for stories of their own as the series progresses. The story moves at a good pace and is generally well constructed though there was one point at which I was waiting for someone to say “it’s a trap,” or words to that effect. The suspense plot otherwise builds well, though, with logical precautions taken at each step. Sierra’s stalkers are smart and capable, which adds to the believability of the story. Overall, this is a solid, engaging romance with a lot of heat. It’s a promising beginning for the new series. I'm always up for a good romantic suspense and I haven't read this author before. Thanks, Nancy! sounds like a "Donna book"